Kingdom Hearts (Japanese: キングダムハーツ, Hepburn: Kingudamu Hātsu) is a 2002 action role-playing video game developed and published by Square for the PlayStation 2 video game console. It is the first game in the Kingdom Hearts series, and is the result of a collaboration between Square and The Walt Disney Company. The game combines characters and settings from Disney animated features with those from Square's Final Fantasy series. It follows the adventures of Sora, a cheerful teenager who fights against the forces of darkness alongside Donald Duck, Goofy and other Disney characters. The game was a departure from Square's standard role-playing games, introducing a substantial action and hack and slash element to the gameplay. Kingdom Hearts has an all-star voice cast and includes many of the Disney characters' official voice actors. It was longtime Square character designer Tetsuya Nomura's first time in a directorial position. Kingdom Hearts was praised for its unusual combination of action and role-playing, as well as its unexpectedly harmonious mix of Square and Disney elements. It was a large presence in the 2002 holiday season, receiving numerous year-end game awards, and went on to achieve Sony "Greatest Hits" status. The game prompted numerous sequels, and the Kingdom Hearts series has gone on to ship over 30 million copies worldwide. Kingdom Hearts is the tenth best-selling PlayStation 2 game of all time, and is considered by some gaming publications to be one of the greatest video games of all time. The game's success resulted in a Japan-exclusive re-release of the game featuring extra content, Kingdom Hearts Final Mix, released in December 2002. The Final Mix version of the game was re-mastered in high definition and released globally in 2013 as a part of the Kingdom Hearts HD 1.5 Remix collection for the PlayStation 3 and PlayStation 4. The main character, Sora, fights against Heartless. The heads-up display consists of a command menu at the bottom left of the screen, and the character health and magic meters on the right side. Kingdom Hearts is influenced by its parent franchise, Final Fantasy, and carries gameplay elements over into its own action-based, hack and slash system. The main battle party consists of three characters: Sora, Donald Duck, and Goofy. Sora is directly controlled by the player from a third person camera angle. All other party members are computer-controlled, though the player can customize their behavior to an extent through the pause menu. Donald and Goofy comprise the party in most areas, but nearly every level features a character who may replace them. For instance, Jack Skellington can join Sora's party in Halloween Town, but cannot accompany the player elsewhere. In some worlds, the party changes its appearance, has abilities unique to that world or both; the characters can fly in Neverland, acquire aquatic forms in Atlantica which enable them to survive underwater, and gain Halloween costumes in Halloween Town to blend in with the locals. Like traditional role-playing games, Kingdom Hearts features an experience point system that determines character development. As enemies are defeated, the player characters gain experience and grow stronger, gaining access to new abilities. Unlike other games of its type, Kingdom Hearts allows a degree of character development customization through a short tutorial found at the beginning of the game. The tutorial allows the player to select from one of three main attributes―strength, defense, or magic―for Sora to excel in and one to lack in. By choosing certain options, the player may manipulate how Sora learns abilities, grows statistically, and gains levels. Donald, Goofy, and any other additional party members are assigned specific areas of strength from the outset. Donald excels in magic, while Goofy excels in defense and special attacks. The game progresses linearly from one story event to the next, usually presented as a cutscene, though there are numerous side quests available that provide benefits to the characters. Players may also choose the order in which they tackle some areas. Most of the gameplay occurs on interconnected field maps where battles take place. 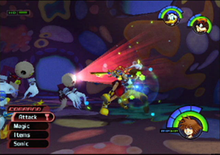 Combat in Kingdom Hearts occurs in real time and involves pressing buttons to initiate attacks by the on-screen character. An action menu, similar to those found in Final Fantasy games, found at the bottom left of the screen provides other combat options such as using magic and items, although players can also assign selected magic spells that can be instantly used whilst holding the shoulder button. As players progress through the game, they can receive certain Disney characters as summons, such as Dumbo and Tinker Bell, each with their own unique abilities. There is also a context-sensitive option at the bottom of the menu, usually used for interacting with the environment or performing special attacks. This menu is manipulated by using the right analog stick or digital pad, while movement is controlled by the left analog stick, allowing the player to navigate the menu while avoiding or approaching enemies. Sora, along with his allies, both possess a Hit Point (HP) meter and a Magic Point (MP) meter, which increase as they gain experience and level up. The MP meter is divided into various sections that are used up whenever that character performs magic, with more powerful magic using more MP. MP can be replenished by performing melee attacks or using items. The HP meter determines the character's health, reducing whenever a character takes damage, although it can be replenished by using healing items or spells. If one of Sora's allies runs out of health, they will be knocked out temporarily until someone heals them. However, if Sora loses all of his health, the game ends and the player must resume play from the beginning of an area or boss. Defeating enemies causes various orbs to fall; green orbs which replenish health, blue orbs which restore MP, and yellow orbs which represent Munny, the game's currency, which can be used to purchase new items. The Gummi Ship is the mode of travel between the various worlds in the game. The gameplay for piloting the vessel is different from the rest of the game as it switches to a rail shooter format. The player controls the Gummi Ship from a rear third-person perspective as it travels in an outer space setting. While traveling, the player must avoid obstacles and defend against enemy ships that attempt to destroy the player's vessel by firing missiles or ramming it. Surviving the route allows access to the next world. Once the player's gummi ship is destroyed, it will have the option to either return to the world selection menu or retry the level. At the beginning of the game, there are few options available to customize the vessel, but as the game progresses, new weapons, engines, and armor become available. Different pre-designed blueprints can be found throughout the game that can be used to quickly construct Gummi Ships. Geppetto also gives the player different Gummi Ship designs based on the number of Heartless defeated. From the start, the player can travel between worlds by using "Normal Drive", which initiates the rail shooter-like minigame. Later in the game, Sora can acquire a "Warp Drive," which allows instant travel between previously-visited worlds without having to play the minigame. However, worlds that have not been visited cannot be accessed with Warp Drive, and must be discovered normally first. The universe of Kingdom Hearts is a collection of various levels, referred to as "worlds," through which the player must progress. Thirteen can be accessed in the game and one, Disney Castle, is shown in cutscenes. Additional worlds are mentioned by various characters, but are inaccessible because they have been destroyed by the Heartless. Ten Disney worlds are based on fiction, primarily from the Disney animated features canon, and the other four were created by Square specifically for the game. The graphics and characters of each worlds were designed to resemble the artwork style of each Disney films. Each Disney world is inhabited by characters from the film: including Hercules and Philoctetes in Olympus Coliseum, and Aladdin, Princess Jasmine and Jafar in Agrabah. Each world is disconnected from the others and exists separately. Most characters in the worlds are unaware of other ones, with few exceptions. Players travel from one world to another via Gummi Ship. The worlds created specifically for the game mirror the overall appearance of the other worlds and feature either new characters or ones from several Final Fantasy games. The new worlds include: the Destiny Islands, where the story opens; Traverse Town, which serves as a launching point for most of the game; Hollow Bastion, which many of the Final Fantasy characters call home; and the End of the World, a large, dark world created from the remnants of various worlds consumed by the Heartless. The main characters travel from world to world to seal each "Keyhole"; this protects the world from the Heartless and ultimately from destruction. They also try to minimize their interaction with characters of other worlds to maintain a balance of separation. This sometimes requires Sora, Donald and Goofy to blend in with the world inhabitants by changing their physical appearance. The collaboration between Disney and Square resulted in a mixture of familiar Disney and Square characters, as well as several new characters created and designed by Tetsuya Nomura. The primary protagonist of the game is Sora, a 14-year-old boy chosen to wield the Keyblade—a weapon which is a cross between a key and a sword—for battling darkness. The game also features two friends from his home world, Riku and Kairi. For most of the game, Sora is joined by Donald Duck and Goofy. Donald, the court wizard, and Goofy, captain of the royal guard, are sent from Disney Castle to find the Keyblade. The three join forces to search for King Mickey Mouse, Kairi, and Riku. The primary antagonist is Ansem, who seeks power and knowledge by using dark beings called the Heartless. The Heartless, hearts corrupted by darkness, serve as most of the enemies encountered in the game and come in a variety of shapes and sizes. Maleficent, from the 1959 film Sleeping Beauty, leads a group of Disney villains that seeks to use the Heartless for their own gain. As a game meant to explore the fictional universes of various Disney films, over one hundred Disney characters are featured in various capacities. While many serve as major characters in the story, others appear in cameo roles, such as the One Hundred and One Dalmatians playing a part in a side-quest. Most worlds also feature a Disney villain whom the player must defeat. The player can summon various Disney characters to fight alongside Sora in battle, causing Donald and Goofy to withdraw from the battlefield for the duration of the summon. Available summoned characters include the Genie from Aladdin, Tinker Bell from Peter Pan, and Simba from The Lion King, among others. Square also incorporated several characters from the Final Fantasy series into the game, though the characters were slightly altered to fit the game's back-story. On the Destiny Islands, the player meets younger versions of Tidus and Wakka from Final Fantasy X, and Selphie from Final Fantasy VIII. In Traverse Town, the player encounters Squall Leonhart (also known as "Leon") from Final Fantasy VIII, as well as Aerith, Cid, and Yuffie from Final Fantasy VII. Rikku from Final Fantasy X was originally set to appear, but was replaced by Yuffie. Cloud and Sephiroth, both from Final Fantasy VII, make appearances in Olympus Coliseum, where the player can fight them in tournaments. The emphasis on characters from later Final Fantasy installments stems from Nomura's hesitation to use characters he did not design. The game also uses other Final Fantasy icons such as the Moogles who mediate item synthesis. Sora, Riku, and Kairi build a raft with the intent to leave the Destiny Islands and explore new worlds. On the night before the planned voyage, the islands are attacked by the Heartless, and Riku and Kairi disappear. Before the Heartless consume the islands, Sora obtains the Keyblade, a weapon effective against the Heartless. Meanwhile, King Mickey has left his own world to deal with the increasing number of Heartless, leaving instructions for Donald and Goofy to find the "key" that will protect the worlds from the encroaching darkness. Donald and Goofy use the Gummi Ship to reach Traverse Town, where they find Sora after he has drifted there from his destroyed world. The three decide to travel together – Donald and Goofy to find Mickey, and Sora to find Kairi and Riku – traveling to various worlds and "Keyholes" in the worlds that, when sealed, prevent the "heart" of those worlds from being consumed by the Heartless. Meanwhile, a group of Disney villains led by Maleficent seek out the seven Princesses of Heart to unlock the final keyhole that leads to Kingdom Hearts, a repository of knowledge and power, and the source of all hearts. Maleficent also finds Riku and recruits him into her services, convincing him that Sora abandoned him and a comatose Kairi while offering her aid to him. Sora and his friends eventually arrive at Hollow Bastion, Maleficent's headquarters, where Riku takes the Keyblade from Sora, revealing himself to be its intended user while Sora only received it in his absence; Donald and Goofy reluctantly leave Sora as per their orders. Sora later challenges Riku, stating that his heart derives strength from his friends, inspiring Donald and Goofy to return to him and regaining control of the Keyblade. After the three defeat Maleficent, Sora finds Kairi's body and confronts Riku, who is now possessed by Ansem, a figure who has been manipulating Maleficent from the beginning to open the way to Kingdom Hearts. Ansem reveals Kairi as the seventh Princess of Heart, her heart having transferred into Sora's body when the Destiny Islands were destroyed. After defeating the possessed Riku, Sora impales himself with Ansem's Keyblade, which is designed to unlock hearts, releasing both his and Kairi's hearts; Kairi's heart returns to her body, in turn completing the final Keyhole, while Sora becomes a Heartless. Kairi later recognizes Sora's Heartless, and the light in her heart restores him to human form. After Kairi gives him a good luck charm, Sora and his group venture to the End of the World to fight Ansem as he reaches the door to Kingdom Hearts, which Ansem believes to be the ultimate reservoir of darkness before being obliterated by the light that bursts through the door. Also beyond the door are Mickey and Riku, who help Sora and his friends close the door before Sora and Mickey lock it with their Keyblades from both sides. The worlds lost to the Heartless reconstruct themselves; as the Destiny Islands reform, Kairi returns there while Sora is forced to part with her. Transported to a winding road, Sora, Donald, and Goofy resolve to find Riku and Mickey. The initial idea for Kingdom Hearts began with a discussion between Shinji Hashimoto and Hironobu Sakaguchi about Super Mario 64. They were planning to make a game with freedom of movement in three dimensions like Super Mario 64 but lamented that only characters as popular as Disney's could rival a Mario game. Tetsuya Nomura, overhearing their conversation, volunteered to lead the project and the two producers agreed to let him direct. A chance meeting between Hashimoto and a Disney executive in an elevator—Square and Disney had previously worked in the same building in Japan—allowed Hashimoto to pitch the idea directly to Disney. Nomura struck down a number of proposals from Disney in order to pursue his own concept featuring an original character not based on a Disney property. The production team consisted of over one hundred members from both Square and Disney Interactive. The game began development in February 2000 and originally focused more on the gameplay with a simple story to appeal to Disney's target age range. After executive producer Hironobu Sakaguchi told director Tetsuya Nomura the game would be a failure if it did not aim for the same level as the Final Fantasy series, Nomura began to develop the story further. When choosing the Disney worlds to include in the game, Nomura and his team tried to pick worlds that had distinctively different looks. They also tried to take into account worlds with Disney characters that would be interesting. Thanks to support from Disney's then-president and current chairman and chief executive Bob Iger, the team had few restrictions on which worlds they could use from the Disney franchises. However, they tried to remain within each character's boundaries set by their respective Disney films. In a June 2013 interview, Nomura stated the name of the game was inspired by Disney Theme Parks, particularly Animal Kingdom, which had recently opened when development on the game began. However, Nomura could not secure the IP as just Kingdom. 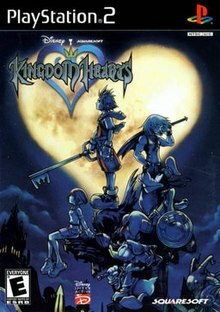 Later on, when the development team began to think about "hearts" as a core part of the story, it was decided to combine the two to form the title Kingdom Hearts. Additional content was added to the North American release that was absent in the initial Japanese release: new optional bosses, one of which was named after the winner of the official website's "Name-In-Game" sweepstakes, an extra difficulty level, and a teaser of Kingdom Hearts II accessible by meeting certain criteria. Nomura included the teaser in order to gauge fan reaction to the possibility of a sequel; he felt that if the idea was unpopular, then it would be best to leave certain events in the game unexplained. The new content was later added to the Japanese re-release Kingdom Hearts Final Mix. Final Mix included further additional content such as new items, cutscenes, and enemies, such as a new secret boss that sets up the sequel. The new content further hinted at plotlines that would be explained in sequels. Some content omitted from Kingdom Hearts was later added into Kingdom Hearts II. A world based on The Lion King, for instance, was unfeasible because an additional program was required to process movement on four legs—a necessity since Sora would become a lion in that world. Due to time constraints, the developers left out an optional boss battle, similar to the Sephiroth battle, against Tifa Lockhart. She was later included in Kingdom Hearts II as a more developed character. Yoko Shimomura composed and produced the music of Kingdom Hearts. While there are arranged melodies derived from previous Disney films, most of the soundtrack consists of original themes written specifically for the game by Shimomura. The opening orchestration and ending credits theme were arranged and orchestrated by Kaoru Wada and performed by the New Japan Philharmonic Orchestra. The main vocal theme for the original Japanese release is titled "Hikari" (光). The English version of "Hikari," "Simple and Clean," was used in the Western releases and the Japanese re-release, Final Mix. Both versions were composed and performed by Hikaru Utada. Her involvement, along with the Japanese song title, was announced in January 2002. Utada was the only singer Nomura had in mind for the Kingdom Hearts theme song. This marked the first time Utada had produced a song for a video game. The single, "Hikari," was released in Japan on March 20, 2002 and proved to be very popular; by August 2002, it had sold over 860,000 copies in Japan. The Kingdom Hearts soundtrack was released on a two CD set on March 27, 2002 in Japan and a year later in the United States. The soundtrack was later included in the Kingdom Hearts Original Soundtrack Complete, which was released in Japan on March 28, 2007. Music from Kingdom Hearts was also included in Shimomura's best works compilation album Drammatica. Kingdom Hearts featured well-known voice actors for both the Japanese and English versions. The Japanese version featured Miyu Irino as Sora, Risa Uchida as Kairi, and Mamoru Miyano as Riku. Other notable voice actors included Kōichi Yamadera, Hideo Ishikawa, and Maaya Sakamoto. A special effort was made to preserve the official voice actors of characters from the Disney movies used in Kingdom Hearts. Some of the voice actors from the related television series or direct-to-video sequels were chosen over the original voice actors from films, where applicable (e.g. Dan Castellaneta as Genie, rather than Robin Williams). The English version featured Haley Joel Osment as Sora, David Gallagher as Riku, and Hayden Panettiere as Kairi. Other notable voice actors included Billy Zane, Christy Carlson Romano, David Boreanaz, James Woods, and Mandy Moore. Kingdom Hearts was announced at the Electronic Entertainment Expo in May 2001. Initial details were that it would be a collaboration between Square and Disney Interactive and would feature worlds developed by both companies and Disney characters. New characters were designed by Nomura and included Sora, Riku, Kairi, and the Heartless. A playable demo was available at the Tokyo Game Show in 2001. The gameplay of the demo showcased many action role-playing game elements that would be included in the final product. To help market the English release of the game, Square launched the official website in April 2002, which featured trailers, a "Name-In-Game" sweepstakes, and other Internet content. On May 14, 2002, a press release announced a list of the English voice actors. The list included Haley Joel Osment, David Gallagher, and Hayden Panettiere as the three new characters introduced in the game. It also announced that many of the Disney characters would be voiced by the official voice actors from their respective Disney films. Other marketing efforts included auctions of the game and related items before the North American release and a Consumer Demo Day in San Francisco, California. Kingdom Hearts received positive reviews and sales figures. During the first two months of its North American release it was one of the top three highest-selling video games and was among the top selling titles during the 2002 Christmas and holiday season. In November 2002, UBS Warburg listed it as the 6th highest console game in terms of sales during the week of November 5. At the end of April 2003, Square announced that Kingdom Hearts had sold its millionth copy in the United States, which made it eligible for PlayStation's "Greatest Hits" status, and over 3.0 million worldwide. Sales reached 1.2 million in Japan in the first quarter of 2004, and broke 4.0 million worldwide. In December 2005, the NPD Group listed it as "one of the top ten best-selling PlayStation 2 titles of all time in North America." By July 2006, Kingdom Hearts had sold through 2.6 million copies and earned $100 million in the United States alone. Next Generation ranked it as the seventh highest-selling game launched for the PlayStation 2, Xbox or GameCube between January 2000 and July 2006 in that country. As of December 2006, Kingdom Hearts had shipped over 5.6 million copies worldwide with 1.1 million in PAL regions, 1.5 million in Japan, and 3.0 million in North America. As of 2006, the original game and the Final Mix version had sold 6 million copies on PS2. As of February 2019 , the Kingdom Hearts series has shipped more than 30 million copies worldwide. The game received critical acclaim among reviewers. In IGN's Best of 2002 awards, it was nominated for "PS2's Best Game of 2002 Editor's Choice Award" and was a runner up for "PS2's Best Game of 2002 Reader's Choice Award." In 2007, the website listed Kingdom Hearts as the 22nd best PlayStation 2 game of all time. Critics commended the visuals, orchestral score, voice acting, and hybrid action-adventure and role-playing feel to the game. IGN named it "Best Art Style/Direction," runner-up for "Best CG Graphics," and honorable mention for "Best Animation" in IGN's 2003 list of "Best Looking Games on PS2." GameSpy listed Kingdom Hearts twice in its "Top 25 Video Game Cinematic Moments." GamePro stated that the graphics were "gorgeous," giving them high marks. The audio was also praised, particularly the quality of the voice-overs and musical score. GamePro had positive comments on the overall audio and gave that aspect a perfect score. Criticism about the gameplay was mixed. Many reviews complained that the camera was at times frustrating and the Gummi Ship portions were out of place. GameSpot cited "tedious" gameplay and Gummi Ship sections as "pale imitations of the Star Fox series," but stated that the combat was fun, particularly the boss fights. Dengeki Online commented on the camera controls, saying that the camera would often run into objects while being rotated by the player. GamePro compared the battle system to "old N64 Zelda games" and had positive comments about Donald and Goofy's artificial intelligence. GameSpot commented that the concept of mixing the serious elements of Final Fantasy with the lighter elements of Disney seemed impossible, but was pulled off quite well. Because of that they awarded Kingdom Hearts "Best Crossover Since Capcom vs. SNK" in their 2002 Best and Worst of the Year awards. GameSpy noted that the periodic departure from the main plot into the Disney side stories was disappointing, and when the original plot builds to a climax, "the story fails to gel thanks to a confusing mish-mash of vague terms and symbolism that probably made more sense in the director's head than in this final product." Aside from the plot, they stated that the overall package was worth playing through to the end. G4TV awarded it "Best Story" at their 2003 G-Phoria awards show. Fan response was also positive; Kingdom Hearts was voted as the 19th best game of all-time by readers of the Japanese magazine Famitsu, 16th by the users of website GameFAQs, and 92nd by IGN users. Kingdom Hearts ranked ninth on IGN's most recent "Top 25 PS2 Games of All Time" list. It was also a nominee for the Best Game Award from the CESA Game Awards [ja] for 2001-2002. In the making of the 2004 video game Fullmetal Alchemist and the Broken Angel the developers, Racjin, looked at other titles for inspiration, particularly Kingdom Hearts when making the game. Multiple versions of Kingdom Hearts have been released. The first was the original Japanese release, followed by the North American and PAL releases, which includes additional content. The game was later re-released in Japan as Kingdom Hearts Final Mix, which features the content of the North American/PAL release, as well as more new content. Both Square and Disney also released numerous types of merchandise before and after the release of the game. Merchandise ranged from toys and figurines to clothing items and books. Like the Final Fantasy games, Square released an Ultimania book on Kingdom Hearts in Japan following the release of the game and a revised edition following the release of Final Mix. In North America, a strategy guide was released by Brady Games. It featured a comprehensive walkthrough and a sticker activity journal. A manga series based on the game was released in Japan and the United States. A novel series also based on the game was released in Japan. It was authored by Tomoco Kanemaki and illustrated by Shiro Amano. The novel series consists of two volumes and was released in North America on March 25, 2008. Originally released only in Japan on December 26, 2002, Kingdom Hearts Final Mix has several events and a number of gameplay tweaks that are not in previous releases. Spoken dialogue is in English, with Japanese subtitles. New scenes, clarifying certain plot points, such as Riku's journey and foreshadowing of Kingdom Hearts II, were included, but no new dialogue was recorded. A gameplay option allows the player to skip cutscenes after seeing them once. The optional bosses first included in the English version were introduced to Japanese players for the first time, along with a new fight against "Unknown Man," in an attempt to raise interest for the sequel. In another attempt at foreshadowing, a video titled "Another Side, Another Story 【 deep dive 】" plays at the ending if the player accomplishes certain tasks. New music tracks incorporated were "Disappeared" and "Another Side." The "Night on Bald Mountain" and "One-Winged Angel" tracks from the English version were included as well. Other changes include new abilities, new weapons, new items, additional and recolored enemies, and gameplay tweaks to make the game easier for the player, along with two new levels of difficulty. When first released, Final Mix included either a deck of Kingdom Hearts cards or special music CD. A limited "Platinum Edition" version of Kingdom Hearts Final Mix was later released with an action figure of Sora, a sticker set, and sketches of some of the main characters. It was released for the first time in North America, Europe and Australia as part of Kingdom Hearts HD 1.5 Remix. The game was adapted into a manga by Shiro Amano. The story follows the events that took place in the game with a few minor differences to account for the loss of interactivity a video game provides. Some events that took place in the Final Mix version were also included. The manga was originally serialized in Japan by Enterbrain's Famitsū PS2, but has since been released worldwide in four volumes. The volumes have been published in English in the United States by Tokyopop. The first volume was released on October 11, 2005, and the fourth volume was released on July 10, 2006. The entire series was later released in a boxed set on October 10, 2006. The manga series has had moderate success. The first volume was ranked 95th in USA Today's "Top 150 best sellers" during the week of its release. IGN praised Amano's artwork and commented on wanting to replay the game after reading. They criticized the lack of new content and stated the transition from game to print lost most of the story's appeal. The series was followed by others based on the game's sequels: Kingdom Hearts: Chain of Memories and Kingdom Hearts II. During August 2011, Nomura expressed desire to release a high definition rerelease of the game though he had yet to confirm such plans. In September 2012, Square Enix announced Kingdom Hearts HD 1.5 Remix, a compilation for the PlayStation 3, that includes both Kingdom Hearts Final Mix and Kingdom Hearts Re:Chain of Memories in HD and trophy support. The character models from Kingdom Hearts 3D: Dream Drop Distance were used as a base for the game's characters. The gameplay of the original Kingdom Hearts was modified to play more like Kingdom Hearts II. Additionally, the collection includes HD cinematic scenes from Kingdom Hearts 358/2 Days. It was released in Japan on March 14, 2013, in North America on September 10, 2013, on September 12, 2013 for Australia, and September 13, 2013 for Europe. In June 2013, Nomura stated that the original game assets for Kingdom Hearts had been lost some time ago. He explained, "[The game data] was lost, so we had to research, and we had to dig out from the actual game what was available and recreate everything for HD. We had to recreate all the graphics and it was actually not that easy." In October 2016, Square Enix announced a single-disc compilation release of Kingdom Hearts HD 1.5 Remix and Kingdom Hearts HD 2.5 Remix for the PlayStation 4. It was released on March 9, 2017, in Japan, and was released on March 28, 2017, in North America, and March 31, 2017, in Europe. An additional piece of free downloadable content for the PS4 version released in June 2017 added a Theater mode for Kingdom Hearts Final Mix. Kingdom Hearts was followed by several sequels, becoming the first game in the Kingdom Hearts series. It was followed by a direct sequel, Kingdom Hearts: Chain of Memories, on the Nintendo Game Boy Advance, which was released in Japan on November 11, 2004. Kingdom Hearts II is the third game in the series, set one year after Chain of Memories, and was released in Japan on December 22, 2005 for Sony PlayStation 2. Like the first game it was re-released as Kingdom Hearts II Final Mix alongside a PS2 remake of Chain of Memories. A Kingdom Hearts game was developed exclusively for V CAST, Verizon Wireless's broadband service, and was released on October 1, 2004 in Japan and on February 4, 2005 in the United States. In November 2008, Kingdom Hearts coded was released for mobile phones in Japan, the game takes place after the events of Kingdom Hearts II. A followup, Kingdom Hearts 358/2 Days, was developed for the Nintendo DS and released in Japan on May 30, 2009 and in North America on September 29, 2009. A prequel was released in Japan on January 9, 2010, entitled Kingdom Hearts Birth by Sleep, for the PlayStation Portable, which takes place 10 years before the events of Kingdom Hearts. The following title in the series was Kingdom Hearts 3D: Dream Drop Distance for the Nintendo 3DS, released in 2012. At E3 2013, Kingdom Hearts III was announced to be in development for the PlayStation 4 and Xbox One. ^ "PlayStation 2 - Kingdom Hearts". PlayStation Underground. Archived from the original on May 28, 2007. Retrieved May 15, 2007. ^ a b IGN Staff (May 14, 2002). "Kingdom Hearts Voice Cast". IGN. Retrieved May 21, 2007. ^ Edge (June 25, 2007). "Interview: Tetsuya Nomura". Next-gen.biz. Next Generation. Archived from the original on July 7, 2007. Retrieved April 28, 2014. ^ a b c "GameSpot's Best and Worst of 2002". GameSpot. 2002. Archived from the original on January 25, 2012. Retrieved April 28, 2014. ^ a b GamePro Staff (April 30, 2003). "Kingdom Hearts sold how many?!". GamePro. Archived from the original on November 30, 2011. Retrieved September 19, 2008. ^ Cooper, Hollander (25 July 2012). "Why Kingdom Hearts II is one of the greatest games ever made". Games Radar. Future Publishing Limited. Retrieved 27 July 2018. ^ Hester, Blake (9 November 2017). "The 500 best games of all time: 300-201". Polygon. Vox Media, Inc. Retrieved 27 July 2018. ^ "Tetsuya Nomura Interview". Edge. Future Publishing (177): 80–81. July 2007. ^ "Official International Kingdom Hearts Website". Square. Retrieved May 14, 2007. ^ a b "Kingdom Hearts for PlayStation 2 (2002)". MobyGames. Retrieved October 18, 2012. ^ a b c d e Turner, Benjamin (September 3, 2002). "Kingdom Hearts Review (PS2)". GameSpy. Retrieved July 5, 2007. ^ a b c d e Kasavin, Greg (September 9, 2002). "Kingdom Hearts for PlayStation 2 Review". GameSpot. Archived from the original on May 2, 2007. Retrieved May 13, 2007. ^ a b c d e Square Co. (2002). Kingdom Hearts Instruction Booklet. Square Co., Limited. ^ a b c d e f g Birlew, Dan (2003). Kingdom Hearts Official Strategy Guide. BradyGames Publishing. ISBN 0-7440-0198-6. ^ Varanini, Giancarlo (April 3, 2002). "Kingdom Hearts Preview". GameSpot. Archived from the original on May 27, 2016. Retrieved May 18, 2007. ^ a b c d "Kingdom Hearts Company Line". GameSpot. Archived from the original on October 19, 2006. Retrieved April 28, 2014. ^ a b c d e Fox, Fennec (September 30, 2002). "Review: Kingdom Hearts for PS2 on GamePro.com". GamePro. Archived from the original on December 27, 2008. Retrieved September 19, 2008. ^ a b "IGN: Kingdom Hearts". IGN. Retrieved May 12, 2007. ^ Square (November 15, 2002). Kingdom Hearts. PlayStation 2. Square Electronic Arts. Goofy: Gawrsh, is that all that's left of the worlds taken by the Heartless? ^ Square (November 15, 2002). Kingdom Hearts. PlayStation 2. Square Electronic Arts. Goofy: Oh, right... I gotcha. While we're in the other worlds, we can't let on where we're from. We've gotta protect the world border. / Donald: "Order." ^ Square (November 15, 2002). Kingdom Hearts. PlayStation 2. Square Electronic Arts. Goofy: This sure is a spooky place. I'll bet the people here are scary-lookin' too. / Donald: Don't worry. We look spooky, too. If they scare us, we'll scare them right back! ^ a b c Gerstmann, Jeff (May 17, 2001). "E3 2001: Square announces Disney RPG for PS2". GameSpot. Retrieved May 13, 2007. ^ "Official Kingdom Hearts Website: Characters" (Select "Characters" tab). Square Enix. Retrieved May 21, 2007. ^ a b Square (November 15, 2002). Kingdom Hearts. PlayStation 2. Square Electronic Arts. King Mickey's Note: Donald, Sorry to rush off without sayin' goodbye, but there's big trouble brewin'. Not sure why, but the stars have been blinkin' out, one by one. And that means disaster can't be far behind. I hate to leave you all but I've gotta go check into it. There's someone with a "key"—the key to our survival. So I need you and Goofy to find him, and stick with him. Got it? We need that key or we're doomed! So go to Traverse Town and find Leon. He'll point you in the right direction. P.S. Would ya apologize to Minnie for me? Thanks, pal. ^ Square (November 15, 2002). Kingdom Hearts. PlayStation 2. Square Electronic Arts. Sora: The Heartless? / Yuffie: The ones who attacked you, you remember? / Leon: Those without hearts. / Yuffie: The darkness in people's hearts—that's what attracts them. / Leon: And there is darkness within every heart. ^ a b c d "Official Kingdom Hearts Website: News". Square Enix. Retrieved May 14, 2007. ^ Square. "Early Kingdom Hearts Concept Art". Kingdom Hearts Ultimania.com. Retrieved May 24, 2007. ^ Boulette, Bryan (November 27, 2005). "Nomura Divulges Kingdom Hearts II Details". RPGamer. Archived from the original on September 30, 2007. Retrieved May 21, 2007. ^ Square (November 15, 2002). Kingdom Hearts. PlayStation 2. Square Electronic Arts. Leon: The Heartless have great fear of the Keyblade. That's why they'll keep coming after you no matter what. ^ Square (November 15, 2002). Kingdom Hearts. PlayStation 2. Square Electronic Arts. Sora: But that's impossible. How did this happen? I'm the one who fought my way here with the Keyblade! / Riku: You were just the delivery boy. Sorry, your part's over now. ^ Square (November 15, 2002). Kingdom Hearts. PlayStation 2. Square Electronic Arts. Donald Duck: Goofy, let's go. We need to remember our mission. / Goofy: Oh! Well, I know the king told us to follow the key and all. But... / Donald Duck: Sora, sorry. ^ Square (November 15, 2002). Kingdom Hearts. PlayStation 2. Square Electronic Arts. Sora: What? You... You're not Riku. / ... / Sora: Tell me. Who are you? / Ansem: It is I, Ansem, the seeker of darkness. ^ Square (November 15, 2002). Kingdom Hearts. PlayStation 2. Square Electronic Arts. Ansem: The Keyhole cannot be completed so long as the last princess of heart still sleeps. / Sora: The princess...? Kairi's a princess? / Ansem: Yes, and without her power, the Keyhole will remain incomplete. ^ Square (November 15, 2002). Kingdom Hearts. PlayStation 2. Square Electronic Arts. Ansem: Don't you see yet? The princess's heart is responding. It has been there all along. Kairi's heart rests within you! / Sora: Kairi... Kairi's inside me? ^ Square (November 15, 2002). Kingdom Hearts. PlayStation 2. Square Electronic Arts. Donald: Well, now what do we do? / Sora: We've gotta find Riku and King Mickey. ^ a b c d Iwata, Satoru (April 2012). "Volume 12 : KINGDOM HEARTS 3D [Dream Drop Distance]". Nintendo of America Inc. Retrieved May 4, 2014. ^ Final Fantasy Retrospective Part XI (GameTrailers.com feature). GameTrailers. October 10, 2007. Retrieved November 20, 2007. ^ Anoop Gantayat (September 23, 2004). "TGS 2004: Tetsuya Nomura Q&A". IGN. Retrieved June 12, 2007. ^ a b c "KHU Interview w/Tetsuya Nomura". Kingdom Hearts Insider. Archived from the original on April 23, 2012. Retrieved April 28, 2014. ^ "Playstation.com Europe - E3 Interview". Kingdom Hearts Ultimania. Archived from the original on April 18, 2007. Retrieved June 15, 2007. ^ a b "Tetsuya Nomura on the Kingdom Hearts Sequels". G4TV. Archived from the original on December 3, 2006. Retrieved June 15, 2007. ^ Splechta, Mike (June 26, 2013). "Tetsuya Nomura discusses Kingdom Hearts 1.5, Kingdom Hearts 3 and Final Fantasy 15". Gamezone. Retrieved June 28, 2013. ^ a b Square Enix (June 25, 2013). Square Enix Presents E3 2013 - Day1 [#03] - KINGDOM HEARTS HD 1.5 ReMIX Interview. Youtube. Retrieved June 28, 2013. ^ Fox, Fennec (April 30, 2003). "Square Confirms Kingdom Hearts Date". GamePro. Archived from the original on November 30, 2011. Retrieved September 19, 2008. ^ "Kingdom Hearts II Ultimania - Tetsuya Nomura Interview". Kingdom Hearts Ultimania. Archived from the original on July 10, 2007. Retrieved August 10, 2007. ^ "Nomura Dengeki Interview #3". Kingdom Hearts Ultimania. Archived from the original on June 11, 2007. Retrieved June 15, 2007. ^ "Kingdom Hearts II Tetsuya Nomura interview". Video Game Blogger. Retrieved June 19, 2007. ^ a b Kingdom Hearts Original Soundtrack CD insert. Toshiba-Emi Limited. 2002. ^ IGN Staff (January 10, 2002). "Hikaru Utada Sings Kingdom Hearts Theme". IGN. Retrieved May 13, 2007. ^ a b Coleman, Stephen (August 22, 2002). "Square, Disney and Japanese Pop Star Utada Hikaru Collaborate on Kingdom Hearts". IGN. Archived from the original on February 6, 2012. Retrieved April 28, 2014. ^ "RELEASE - Single 光" (in Japanese). EMI Music Japan. Retrieved September 19, 2008. ^ "Kingdom Hearts Original Soundtrack Complete" (in Japanese). EMI Music Japan. Archived from the original on February 24, 2008. Retrieved April 28, 2014. ^ "Drammatica -The Very Best Of Yoko Shimomura" (in Japanese). HMV Japan. Retrieved February 26, 2008. ^ "Full cast and crew for Kingdom Hearts (2002) (VG)". IMDB. Retrieved July 5, 2007. ^ a b Fox, Fennec (April 30, 2003). "Kingdom Hearts Voice Talent Announced". GamePro. Archived from the original on January 13, 2009. Retrieved September 19, 2008. ^ Sains, Alex. "Kingdom Hearts voice actors". Final Fantasy Net. Archived from the original on August 4, 2006. Retrieved April 28, 2014. ^ "Kingdom Hearts (credits)". GameSpot. Archived from the original on September 29, 2007. Retrieved April 28, 2014. ^ Gerstmann, Jeff (October 12, 2001). "TGS 2001 FallKingdom Hearts hands-on". GameSpot. Retrieved May 18, 2007. ^ IGN Staff (May 14, 2002). "Square Opens Kingdom Hearts Page". IGN. Retrieved May 13, 2007. ^ Bryant, Paul (August 8, 2002). "Kingdom Hearts auction now live". Gaming Age. Archived from the original on October 11, 2007. Retrieved September 25, 2007. ^ Klepek, Patrick (August 13, 2002). "Kingdom Hearts Consumer Demo Day". Gaming Age. Archived from the original on October 11, 2007. Retrieved September 25, 2007. ^ Calvert, Justin (November 18, 2002). "October video game sales". GameSpot. Retrieved July 5, 2007. ^ Stephen Coleman (November 13, 2002). "UBSW Top 10 Games For the week ending Nov. 11". IGN. Archived from the original on March 29, 2012. Retrieved April 28, 2014. ^ GameSpot Staff (March 17, 2004). "Kingdom Hearts tips scales at 4 million". GameSpot. Retrieved May 18, 2007. ^ Coleman, Stephen (February 8, 2006). "Kingdom Hearts II Gets All-Star Cast". IGN. Archived from the original on March 14, 2012. Retrieved April 28, 2014. ^ Square (February 5, 2007). "Kingdom Hearts Series Ships over 10 Million Worldwide". GameSpot. Archived from the original on December 9, 2012. Retrieved April 28, 2014. ^ "Kingdom Hearts (PS2) Reviews". Metacritic. Retrieved July 5, 2007. ^ "Kingdom Hearts PS2 Game". 1UP.com. Archived from the original on June 29, 2011. Retrieved May 20, 2007. ^ Mugwum (December 11, 2002). "Kingdom Hearts Review". Eurogamer. Archived from the original on March 10, 2005. Retrieved June 7, 2007. ^ プレイステーション2 - キングダム ハーツ. Weekly Famitsu. No.915 Pt.2. Pg.75. June 30, 2006. ^ "Kingdom Hearts (PS2)". Famitsu.com. Retrieved April 28, 2014. ^ Andrew Reiner. "Kingdom Hearts Review". Game Informer. Archived from the original on October 11, 2007. Retrieved June 22, 2007. ^ Geoff Keighley (September 20, 2002). "Kingdom Hearts Review" (673). Entertainment Weekly: 109. Retrieved May 19, 2012. ^ a b IGN Staff (July 31, 2003). "G-Phoria Report". IGN. Retrieved August 7, 2007. ^ Perry, Douglass C. (March 20, 2003). "IGN: The Best Looking Games on PS2". IGN. Retrieved May 13, 2007. ^ IGNPS2 Staff (January 17, 2003). "Best of 2002: Best Game of the Year". IGN. Retrieved August 7, 2007. ^ IGN PlayStation Team (March 16, 2007). "The Top 25 PS2 Games of All Time". IGN. Archived from the original on June 5, 2007. Retrieved March 18, 2007. ^ Perry, Douglass C. (March 20, 2003). "The Best Looking Games on PS2". IGN. Retrieved May 13, 2007. ^ "GameSpy's Top 25 Video Game Cinematic Moments". GameSpy. April 16, 2007. p. 2. Archived from the original on June 16, 2012. Retrieved April 28, 2014. ^ "GameSpy's Top 25 Video Game Cinematic Moments". GameSpy. April 16, 2007. p. 4. Archived from the original on June 16, 2012. Retrieved April 28, 2014. ^ 電撃オンライン編集部がオススメするソフトを個性的なレビュアーがアツく語る! (in Japanese). Dengeki Online. Archived from the original on June 9, 2007. Retrieved July 8, 2007. ^ "Famitsu Reveals Top 100 Reader-Voted Games Of All-Time". Gamasutra. March 3, 2006. Retrieved May 29, 2007. ^ "Fall 2005: 10-Year Anniversary Contest - The 10 Best Games Ever". GameFAQs. 2005. Archived from the original on July 16, 2015. Retrieved July 5, 2007. ^ IGN Site Staff (2006). "Readers' Picks Top 100 Games: 91-100". IGN. Archived from the original on January 25, 2012. Retrieved May 29, 2007. ^ IGN Site Staff (2006). "Top 25 PS2 Games of All Time". IGN. Archived from the original on June 29, 2011. Retrieved August 24, 2010. ^ "最優秀賞は「FF10」!! 「第6回 CESA GAME AWARDS」授賞式". GPARA.COM. Archived from the original on August 26, 2011. Retrieved May 28, 2009. ^ Alfonso, Andrew (May 13, 2004). "E3 2004: Fullmetal Alchemist - Interview". IGN. pp. 1–3. Retrieved May 27, 2008. ^ "Kingdom Hearts Official Strategy Guide". Brady Games. Retrieved July 7, 2007. ^ "Kingdom Hearts the First Door". Indigo Books and Music. Archived from the original on May 21, 2008. Retrieved October 2, 2007. ^ "Kingdom Hearts Darkness Within". Indigo Books and Music. Archived from the original on May 25, 2008. Retrieved October 2, 2007. ^ a b c "Kingdom Hearts Final Mix". IGN. Retrieved May 13, 2007. ^ a b "Kingdom Hearts Insider - Final Mix". Kingdom Hearts Insider. Archived from the original on May 9, 2007. Retrieved May 29, 2007. ^ Studio BentStuff (2005). Kingdom Hearts Series Ultimania α ~Introduction of Kingdom Hearts II~ (in Japanese). Square Enix. ISBN 4-7575-1597-9. ^ "Kingdom Hearts: Final Mix (Import)". Neoseeker. Retrieved May 29, 2007. ^ a b Robert Peeler (February 26, 2013). "Announcing KINGDOM HEARTS HD 1.5 ReMIX". Square Enix. Archived from the original on February 28, 2013. Retrieved April 28, 2014. ^ a b "KINGDOM HEARTS HD 1.5 ReMIX, releasing exclusively for PS3". PS3 News. February 26, 2013. Retrieved February 26, 2013. ^ a b "Kingdom Hearts HD 1.5 ReMIX coming to Europe!". Square Enix. February 25, 2013. Archived from the original on February 27, 2013. Retrieved April 28, 2014. ^ a b Goldstein, Hilary (September 12, 2002). "Kingdom Hearts Vol. 1 Review". IGN. Retrieved March 18, 2008. ^ Kingdom Hearts, Vol. 1 (Paperback). Tokyopop. ISBN 1598162179. ^ Kingdom Hearts, Vol. 4 (Paperback). Tokyopop. ISBN 1598162209. ^ Kingdom Hearts Boxed Set--vols 1-4 (Paperback). Tokyopop. ISBN 1598168088. ^ "USA Today Best-Selling Books Database - Top 150 best sellers". USA Today. Retrieved July 5, 2007. ^ "Kingdom Hearts: Chain of Memories Volume 1". Tokyopop. Archived from the original on October 13, 2007. Retrieved April 28, 2014. ^ Kingdom Hearts II Volume 1 (Kingdom Hearts (Graphic Novels)) (Paperback). Tokyopop. ISBN 1427800588. ^ "Nomura talks KH3D and possible KH HD remake". Andriasang. August 9, 2011. Retrieved April 28, 2014. ^ "Kingdom Hearts 3D: Dream Drop Distance". Game Informer. GameStop Corporation (230): 80. June 2012. ISSN 1067-6392. ^ "Nomura Teases Kingdom Hearts II HD And Other Kingdom Hearts HD 1.5 Remix Tidbits". Siliconera. October 2, 2012. Retrieved October 3, 2012. ^ Romano, Sal (December 20, 2012). "Kingdom Hearts HD 1.5 Remix Japanese release date set". Retrieved May 7, 2013. ^ Karmali, Luke (June 27, 2013). "Original Kingdom Hearts' Assets Lost". IGN. Retrieved June 27, 2013. ^ Nunneley, Stephany (October 27, 2016). "Kingdom Hearts HD 1.5 + 2.5 Remix announced for March release on PlayStation 4". VG 24/7. Retrieved October 27, 2016. ^ Gilyadov, Alex (June 12, 2017). "E3 2017: KINGDOM HEARTS HD 1.5 + 2.5 REMIX FREE DLC ADDS THEATER MODE, NEW SCENE". IGN. Retrieved July 30, 2017. ^ "Kingdom Hearts: Chain of Memories". IGN. Retrieved September 4, 2007. ^ "Kingdom Hearts: Chain of Memories Info". GameFAQs. Retrieved May 24, 2007. ^ "Kingdom Hearts II". IGN. Retrieved September 4, 2007. ^ Anoop Gantayat (September 13, 2006). "Kingdom Hearts II Update For PS2". IGN. Retrieved March 11, 2007. ^ "Kingdom Hearts". IGN. Archived from the original on February 7, 2012. Retrieved August 8, 2007. ^ Charles Onyett (September 19, 2007). "Three New Kingdom Hearts Titles". IGN. Retrieved September 19, 2007. ^ Anoop Gantayat (June 18, 2010). "Tetsuya Nomura on Kingdom Hearts 3D". Andriasang. Retrieved April 28, 2014. ^ Alexa Ray Corriea (June 10, 2013). "Kingdom Hearts 3 coming to PS4". Polygon. Retrieved June 10, 2013. ^ "E3 2013: Kingdom Hearts III Heading to Xbox One". IGN. June 11, 2013. This page is based on the Wikipedia article Kingdom Hearts (video game); it is used under the Creative Commons Attribution-ShareAlike 3.0 Unported License (CC-BY-SA). You may redistribute it, verbatim or modified, providing that you comply with the terms of the CC-BY-SA.